A delicious and easy to prepare side dish casserole loved by everyone in the family.. 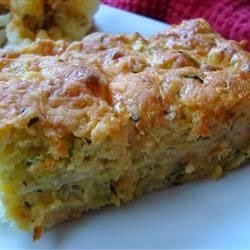 In a large bowl mix together the zucchini, onion, eggs, muffin mix, salt and pepper. Stir in 4 ounces of the cheese. Spread this mixture into a greased 2 quart casserole dish; top with remaining 4 ounces of cheese. Bake in a preheated oven for 60 minutes.